Now that summer is officially here, it’s always a good idea to head out to the beach, swim, enjoy the sun and pretty much completely take it easy. The beach also provides a pretty good opportunity to check out other people’s tattoos. Personally, I never feel all that good about staring at people as it can lead to a multitude of problems. Try explaining to your girlfriend that you were only looking at that girl in the bikini’s tattoo and you’ll quickly understand what I mean. So for those of us who want to look at other people’s tattoos but who also want to avoid the stress that can sometimes come along with such a pursuit, might I suggest one of the all time great summertime activities: reading. If you don’t feel like doing much reading while you’re lying in a near comatose state on the beach, then I’ve got just the thing for you. 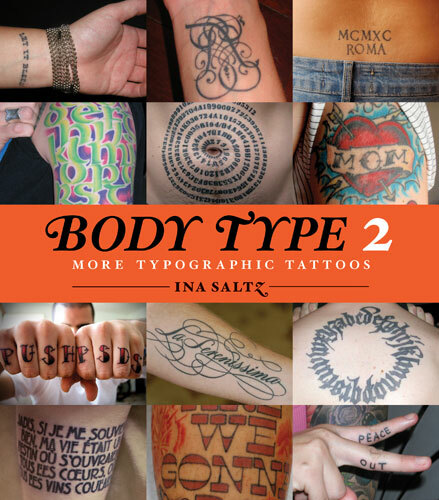 Body Type 2 is the latest book by author, designer and art director Ina Saltz. The book is the follow up to her best-selling first volume, Body Type: Intimate Messages Etched in Flesh. Inside Body Type 2, you’ll find over 200 diverse photos of people’s typographical tattoos. So instead of reading, you can just leisurely flip through the book’s pages, checking out tattoos that are pretty much guaranteed to impress you with their originality and style. If you head over to Mediabistro.com, you can check out a short 7 question interview with Saltz regarding her books and her love of typographical tattoos. There’s also a quick video teaser of some of the tattoos that can be found on the pages of Body Type 2.